Combines the art of aromatherapy with the technique of massage, bringing balance and harmony to the body physically, mentally, and emotionally. Contains: Seven Single Oils (5ml bottles): Thyme, Basil, Peppermint, Oregano, Wintergreen, Cypress and Marjoram. Two Oil Blends (5ml bottles): Valor® & Aroma Seiz™. Also contains one 8-oz. bottle of Ortho Ease® Aromatherapy Massage Oil and one 8-oz. V-6™ Enhanced Vegetable Oil Complex. Also includes an instructional DVD that will teach you how to perform the Raindrop Technique® on others. 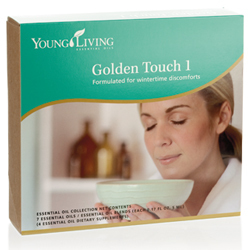 Golden Touch 1™ kit provides immune protection all throughout the year. The oil blend formulas in this collection have been specifically created to take advantage of essential oil constituents that support many functions of the body. A growing number of today's professionals consider essential oils to be an important component in health care. Contains: 5ml bottles of: Di-Gize™, EndoFlex™, JuvaFlex™, Melrose™, Raven™, R.C.™, and Thieves®. The Essence of the Season collection includes: 5 ml bottles of Frankincense, Myrrh, Christmas Spirit oil blend, along with Frankincense and Myrrh resin. The essential oil blends in the Reconnect Collection are designed to relax the mind and support a determination to stay on task, and to help ground and unite the body, mind, and spirit with real life. The oils can uplift mood and support a positive outlook that allows the mind to react positively and engage with one's surroundings. Using these oils can help lead to a restful night's sleep by relaxing and calming the body and mind to release negative emotions and promote higher thoughts of self-worth. Contains the twelve most significant oils found in the Bible. Gary Young draws on his travels to biblical lands and explains the twelve oils on an audio CD (included in this collection). Contains 12 - 5 ml bottles: Aloes/Sandalwood (Santalum album), Cassia (Cinnamomum cassia), Cedarwood (Cedrus atlantica), Cypress (Cupressus sempervirens), Frankincense (Olibanum -- Boswellia carteri), Galbanum (Ferula gummosa), Hyssop (Hyssopus officinalis), Myrrh (Commiphora myrrha), Myrtle (Myrtus communis), Onycha (pronounced oh-nigh-kah, a very thick oil, remove the plastic orifice and warm the bottle in your hand so that the oil will flow -- Styrax benzoin), Rose of Sharon/cistus (Labdanum -- Cistus ladanifer), and Spikenard (Nardostachys jatamansi). The oils included in the Feelings Kit are: Harmony, Valor, Forgiveness, Release, Present Time, & Inner Child. The Aroma Complete is a collection of over 120 of Young Living's essential oil singles and blends to increase your ability to address an entire range of health, emotional, and spiritual concerns. Includes carrying case. Note: Oils will vary according to season and availability. Young Living reserves the right to substitute oils of equal or greater value.